You are currently viewing cartridges for HP Officejet 4500, and not HP Envy 4500 e-All-in-One (which uses different cartridges). Im just asking if 901 OfficeJet is compatible to a HP OfficeJet Advantage 4500 because when im going to change to ink cartridge I see a 703 I'm just asking if the 703 ink cartridges and 901 are both compatible with HP OfficeJet Advantage 4500? Thank you for your query. Below is the Cartridge Save website page displaying all cartridges that will work with the HP Officejet Advantage 4500: * https://www.cartridgesave.co.uk/ink-cartridges/HP/Officejet-4500.html I hope this helps but if you have any further queries please do not hesitate to contact a member of the team. How long will a compatible 901XL cartridge last for if unopened? We advise that our compatible HP Officejet 4500 ink cartridges will have an expiry date of at least 12 months from the date of purchase, provided they are stored in a cool, dry place in their unopened boxes. 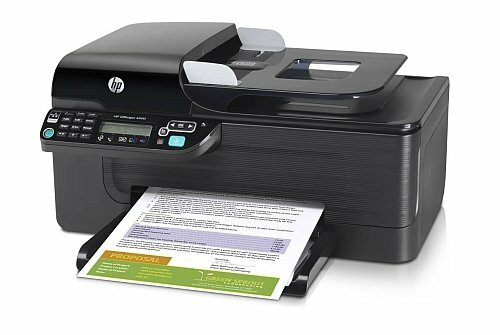 I'm in the process of buying a new HP 4500 Officejet printer to replace the Officejet 4315 all-in-one I currently have. I have a supply of No. 21 (black) and No. 22 (colour) cartridges (already out of their packaging) that I would like to be able to use with the new printer. Which HP Officejet all-in-one would allow me to use these cartridges? Have you any front-loading trays for the Officejet 4500 printer? Please advise and provide a price for me? Thanks, Simon. Unfortunately, we don't supply printers or paper trays. Cartridge Save only stocks ink cartridges and consumables for the HP Officejet 4500 printer. We advise you to contact HP directly for help in purchasing a new paper tray. Do you do an XL version of the HP 901 tri-colour ink cartridge? Sorry, we only stock a HP 901XL high capacity black cartridge, the tri-colour cartridge isn't available in XL size. HP don't produce a HP 901XL high capacity tri-colour ink cartridge so you can only use the HP 901 standard capacity tri-colour ink cartridge in your Officejet 4500 printer. For a cheaper cost-per-print, you might like to try our compatible HP 901 tri-colour cartridge which acts as a direct replacement for the HP product. Is there a high capacity 901 colour cartridge, or an "equivalent cartridge"? Unfortunately, HP don't manufacture a HP 901XL colour cartridge, it's only available in black. This also applies to our premium brand recycled cartridges. Hi, just had some HP inks from you which were No. 21 and 22. I think my printer has had it. What other printer could I buy to use them in? This is the first time I've ordered ink for my HP Officejet 4500 and I don`t know what type to buy? As long as your HP Officejet 4500 was purchased in the UK then all of the items listed above are guaranteed to work within your printer. Your printer manual should advise you on which cartridges you require. Alternatively, you can look at the codes on the cartridges which are currently installed in your printer and order the same ones. If you're still unsure please don't hesitate to contact a member of our friendly freephone support team. Can I buy a black only Officejet 4500 ink cartridge from you and, if so, for how much? Yes, the HP Officejet 4500 can use either the genuine black HP 901 ink cartridge (CC653AE) or the genuine high capacity black HP 901XL ink cartridge (CC654AE) as listed above. Don't forget, we also supply cheaper compatible ink cartridges such as the compatible HP 901XL high capacity black ink cartridge. When will your premium brand recycled ink cartridges for the HP Officejet 4500 be back in stock? Good news! Our compatible HP Officejet 4500 ink cartridges are now back in stock and ready to order. Rather that the HP 901 cartridges, can you use any other cartridge in the HP Officejet 4500 printer? Presuming your HP Officejet 4500 printer was purchased in the UK, you'll need to use the HP 901 or 901XL cartridges. No other cartridges will work in this printer. Can you please give me the dimensions of the HP Officejet 4500 in feet and inch's please? Unfortuantely, we're unable to provide this exact information. However, our printer review of the HP Officejet 4500 provides you with similar information from which you may be able to convert measurements into the format you require. Please scroll to the bottom of this page to read our review of the HP Officejet 4500 inkjet printer. Alternatively, please follow the link below which will take you to HP's official website. Want HP OfficeJet 4500 inks in a flash? Check out what Cartridge Save have for you! Doing your research to find replacement inkjet cartridges tends to be a cumbersome hassle, even more so when it means the need to visit or perhaps even get a hold of different providers. On the other hand, buying OfficeJet 4500 print cartridges really doesn't have to have to be a troublesome experience. Order some HP OfficeJet 4500 printer ink here at Cartridge Save. When you take the final decision to buy discounted HP ink cartridges through Cartridge Save, you can be certain in the fact that your most recent purchase will most likely arrive on the very next day. All OfficeJet 4500 inkjet supplies online with Cartridge Save are additionally protected with a long money-back guarantee. In the instance that you've difficulties, simply post us your cartridge for a full refund. Part of the Officejet all-in-one range, the 4500 is designed to bridge the gap between the workplace and home. With built in scanner and copier, the HP 4500 printer is fantastic value for money. The 4500 doesn't standout in any-one department; it's a solid all-rounder that's best suited as a home office printer. The speed, quality-output and connectivity aren't quite at the level where the 4500 could be used in a purely office based setting. The 4500 is fairly bulky (42.8 x 42 x 21.5 cm) which is to be expected from a printer with so many functions. The LCD and control panel on the right of the printer allows you to send faxes, print copies and scan images, all at the click of a button. The printer's paper capacity may pose problems, the 100 sheet input tray isn't ideal, even for the smallest of offices. The output tray is poorly designed, with nothing to prevent paper spilling out onto the desk. These two factors alone may render the 4500 obsolete as a business printer. Replacing the HP 4500 cartridges is easy and takes very little time. The HP 4500 inkjet printer comes with some nifty functions that set it aside from some of its competitors. The 20 page automatic document feeder is perfect if you spend lots of time handling multi-page documents which would be too time consuming to scan one after the other. The printer can also scan to email at the click of a button. Document print quality is impressive, with sharp text and little to no fading. Scan quality is another area where the HP 4500 printer competes well – expect clean results with no contrast issues. Image quality was average at best, with photographs lacking contrast and the punch of a decent quality photo inkjet. Print speed is another issues that needs addressing, both text documents and graphics were substantially slower than the quoted times. Wireless connectivity an Ethernet connection or even flash drive support would have made the HP 4500 inkjet printer a more flexible device for both home and office use.